Jump Super Stars (ジャンプスーパースターズ Janpu Sūpā Sutāzu?) is a 2D fighting game for the Nintendo DS. It was developed by Ganbarion and published by Nintendo. The game was released on August 8, 2005 in Japan and accompanied the release of a red Nintendo DS. 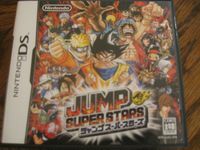 Jump Ultimate Stars, the sequel to Jump Super Stars, has been released in Japan as of November 23, 2006. Jump Super Stars features characters from the Weekly Shonen Jump manga magazine in Japan. The game features gameplay similar to that of Super Smash Bros. The game supports 2-4 players in multiplayer and features over 75 missions. Koma (panel) is the term for the characters that the player can use in the game. Each koma uses from 1 to 7 squares of the koma deck at the bottom screen of the Nintendo DS. The deck has 20 squares (4 x 5) for the player to place his koma. There are three types of koma: help koma, support koma and battle koma. Help koma are only one square large. They'll boost up or help players in the game, but they will not appear on Battle Screen. Support koma are two to three squares large. These koma will show up briefly on the battle screen to help the player, generally by attacking, blocking, restoring health, or some other move. Battle koma are four to seven squares large, and these koma fight throughout each round. These koma represents the characters that the player controls in the battle screen, and the player can switch between characters by tapping their koma in the koma deck like a tag battle. The player can build and store up to ten koma decks, and each deck must have at least one help koma, one support koma and one battle koma to be valid for use in battle. There are also a set of predefined decks that the player can use, but the player cannot change or delete those. It is also possible to exchange decks between friends, but they won't be able to edit the decks. Ally boosting is done by placing koma next to each other in the deck maker. If the koma placed next to each other are "compatible", their attributes will go up. Battle characters can get a longer health bar, or increase the maximum number of special attack gauges." Source: Wikipedia, "Jump_Super_Stars," available under the CC-BY-SA License.